As we pointed out in our previous two blog posts, part 1 and part 2, and as recently discussed by Steven Bell in “Resolving the Link Resolver Problem,” the problems and impacts of failed links and the costs of delivering a poor link resolver user experience are not always fully realized by libraries. Link resolver reliability and user experience play a pivotal role for libraries trying to meet the common challenges of serving end-user needs, justifying budgets, and demonstrating the value of library services. Any library interested in improving discovery of their resources as a means to increase the value of the library should make improving linking one of their highest priorities. Traditional link resolver technology has been around for more than a decade, but has not had enough improvements introduced to keep pace with ever-growing electronic collections, as well as users’ increasing expectations to get immediate and direct access to full text. That’s why we released our latest innovations for 360 Link – which could be considered the most meaningful improvements for link resolvers in more than a decade. With these advancements, ProQuest is proving to be the only link resolver vendor that is investing in, and delivering, significant innovations in both linking reliability and user experience. Our latest enhancements to 360 Link include a new user interface concept based on extensive usability testing and feedback from end users and Beta partners, as well as new advances in linking technology. The newly designed 360 Link includes a Sidebar Helper frame that compliments a user’s one-click access to full text, with intuitive access to help and additional library resources. The Sidebar Helper frame provides clearer pathways for end-users to get to desired content, eliminates the most common confusion points in the linking experience, and allows for greater promotion of library services at the most critical point in the users’ research workflow. This is a win for both end users and libraries. In addition to a new interface redesign, and more importantly, 360 Link dramatically improves link reliability by expanding the boundaries of link resolver technologies. 360 Link has introduced Index-Enhanced Direct Linking (IEDL) to move link resolvers beyond a sole reliance on less predictable OpenURL linking. Originally developed for the Summon service, IEDL technology improves link reliability by eliminating common metadata mismatches between referring sources and target platforms that often cause problems for traditional OpenURL link resolvers. Using provider specific data elements curated from the vast Summon® unified index, IEDL provides verified and unmediated, one-click access to full-text content from more than 370 providers representing greater than 4,000 databases, covering more than half a billion journal articles and other content types. Unlike OpenURL technologies which can fail from 5-30% of the time1, IEDL links deliver near 100% reliability, resolve to content faster and are updated more frequently. By integrating IEDL technology into 360 Link end-users will benefit whether a library subscribes to the Summon service or not, and regardless of the user’s starting point. Users coming from Google Scholar, A&I databases, PubMed, Web of Science, Scopus or other popular discovery points will enjoy the same level of superior link reliability as if coming directly from a discovery service or full text database. 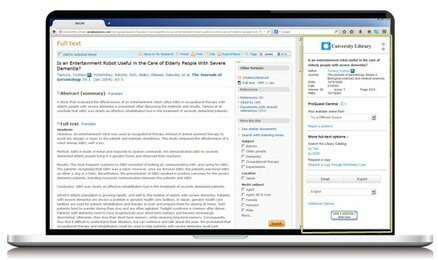 In addition to providing more reliable linking than traditional link resolvers, the new 360 Link Sidebar Helper frame offers a user experience that provides libraries a more persistent presence and higher visibility in the researcher’s workflow as well as unique opportunities to help users at the point of need. This is another critical advancement for libraries because, despite the success of library centered discovery tools, the fact remains that vast amounts of research are started from somewhere outside of the library’s Web environment. Google Scholar certainly plays a significant role in many typical researcher workflows. And for research beginning with Google, it is the library’s link resolver that plays a starring role in connecting researchers to the content they desire. While this blog series has already discussed some of the ramifications of unreliable link resolver links from sources like Google, we have yet to mention there can also be a surprising hidden cost to libraries when successfully integrating their link resolver with Google. A 2011 article by Jeremy Frumkin and Terry Reese warned of the obvious need for libraries to be recognized for their role in brokering access to information especially when users begin research with Google Scholar. Yet the authors noted, “unfortunately, libraries have few mechanisms that allow them to visibly communicate their critical role in provisioning such content.”2 So, in other words, when the link resolver works well from Google Scholar – that is when users succeed in linking seamlessly to full text—the problem for libraries is that users often don’t realize that it is the library that is paying for access to the content they are after. This can perpetuate the notion that “Google works great” for research and that the library may not be needed as the researcher’s primary gateway to quality content. The new 360 Link Sidebar Helper frame solves this dilemma for libraries by providing libraries with a more persistent presence in the researcher’s workflow. In addition to providing branding opportunities for the library, the 360 Link Sidebar provides intuitive links to library resources including access to librarians via integrated links to reference chat that appear in-line with the articles, journals and books that users are accessing. This not only gives libraries a way to get credit for providing access to the content their users are seeking, but it provides new possibilities to provide additional services and perhaps more importantly capture traffic back to the library even when users begin their research elsewhere. The recently introduced 360 Link innovations set 360 Link apart from other link resolvers by providing more utility and value to both end-users and librarians. The strength of the new 360 Link lies in the unique ability to deliver the most reliable linking for end-users via the combined approach and coverage brought forth by having both OpenURL-based linkers tied to our superior knowledgebase and direct links tied to the Summon Index. When paired with an intuitive user experience that provides more help to users at the point of need, while giving libraries new opportunities to promote their services, 360 Link is the link resolver best positioned to meet users’ needs and expectations. It is worth noting that ProQuest is delivering these transformative link resolver innovations at a time when many vendors exclusively focus attention on discovery services and library management platforms – and are seemingly ignoring the need to improve the user experience through linking. We know that libraries recognize the importance of linking as one of the most critical aspects of the services they provide their users. Linking is not something that should be forgotten or taken for granted when evaluating products critical to the library’s mission. Jeremy Frumkin & Terry Reese. “Provision Recognition: Increasing Awareness of the Library's Value in Delivering Electronic Information Resources.” Journal of Library Administration, (2011) 51:7-8, 810-819.